TV 1 is taking the political pulse of the nation on an election road trip. Tonight they stopped in Oturehua and found 100% support for National. That isn’t anything to get excited about however, because they only asked three people. The last time I stopped in Oteurehua was in January for a National Party branch AGM. We adjourned to the pub which had a very good array of Central Otago wines which the publicans explained was a result of demand from cyclists on the rail trail. TV 1 News has Ministry of Foreign Affairs papers which show Winston Peters pushed for Owen Glenn to be made honorary consul for Monaco. Foreign Affairs chief executive Simon Murdoch wrote to Peters’ senior officials in April 2007 saying Peters had requested to appoint an expat of his choice as the honorary consul in Monaco. 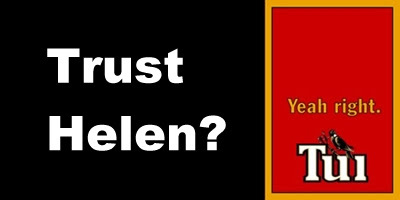 The next day one of Peters’ senior advisors clarified that the name Peters put forward is Glenn’s. By the end of August last year Peters was frustrated with the lack of progress. He was pushing for New Zealand’s ambassador in France to meet Glenn over the posting, according to an email from the deputy secretary of Foreign Affairs. The papers were only released after the intervention of the Ombudsman. Guyon Espiner says that the documents show Peters lobbied hard for the appointment. Glenn said in September that Peters had supported his bid for the position but Peters has always denied that. National is to increase the number of prisoners learning industry-based skills and parole will be refused for anyone who is eligible but chooses not to participate. The party will also double the numbers receiving alcohol and drug treatment. “At present, 43% of all prisoners – and 65% of those under 20 – re-offend within a year of release, and we must do more to change that. “For too many criminals, a prison sentence is just an enforced career break. “It’s a waste of taxpayer money to let these people serve their time without challenging them to change their behaviour – only to release them and then throw them back into prison again when they re-offend. “That will mean more victims, and it’s vital that’s changed. The party’s prisons policy is here. No means . . . The Tauranage Special from the Free Speech Coalition. 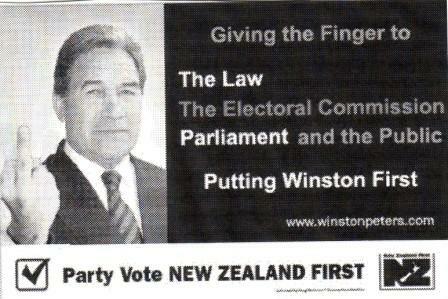 I suspect that anyone much younger than I am might not realise that Winston Peters is mimicking WInston Churchill’s v for victory in his advertising and may in fact think it’s an old fogey who doesn’t know how to give the fingers. Trouble is with MMP she could lose the election and still win power. That would be great for the country – yeah right. You are currently browsing the Homepaddock blog archives for the day Tuesday, October 28th, 2008.